Hopefully your bike tour will never include a story about being caught in a flood. If fortune doesn’t smile upon your tour, here are 3 tips on how I handled being caught in the Potomac River flooding on my latest bike tour. I’m not saying my bike tours are cursed this spring, but given the catastrophic endings both have had, I might be convinced someone up there, down there, or over there is not interested in having me complete a tour as planned. The day before I left the mid-Atlantic and Appalachian region got hit with a deluge of rain – up to 5 or 6 inches within 24 hours fell on the tributaries of the major rivers in the region, and that meant a flood was coming. 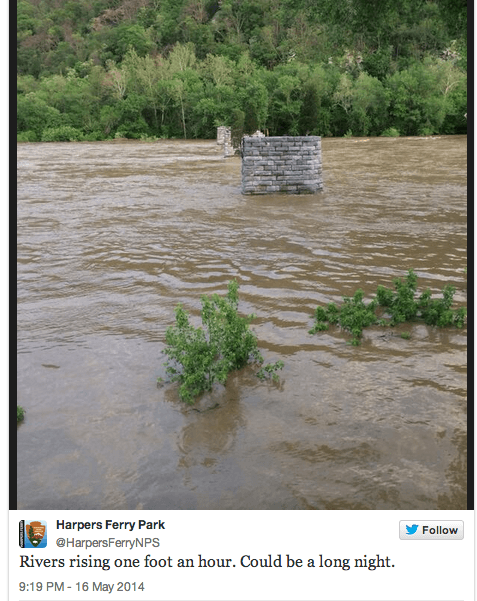 Although I knew there was a possibility – even a likelihood – of a flood on the Potomac, I noticed that the US Park Service had only closed boat ramps and side hiking trails as of Friday. Because there were no warnings that the C+O towpath (my bike route of choice) was directly impacted, it seemed safe to go with my plan to bike from DC to Harpers Ferry and back, camping on the hiker/biker campgrounds along the way. The night I arrived, I noticed most of the hiker/biker campsites were feeling the effects of the surging river already. I checked the NPS website, Twitter feed and the NOAA flooding info pages for more. That gave me enough info to know the water was only going to rise through the night. River levels were to go up two feet more, and it seemed my tent and location was more than two feet higher than the water levels. At that point, I knew 30 miles downriver from there, it was likely that same rise rate would be where I was within a few hours. I nearly started packing up in the dark, but I didn’t. Why? Because there were two enormous bulldozers at my campsite, and I was absolutely positive the Park Service wouldn’t risk equipment like that on land they thought might flood. My first instinct was correct… my second? Not so much. So, trust your instincts… just not all the time. I’ve written about touring through adverse conditions, and this certainly qualified! When I woke up after sunrise I noticed far more insects between my tent and my fly than I would normally expect. Hmm, weird. I put my hand down on the tent floor… bone dry… but something was amiss. As I put more weight down, I felt a sensation not unlike being on a bad water bed. 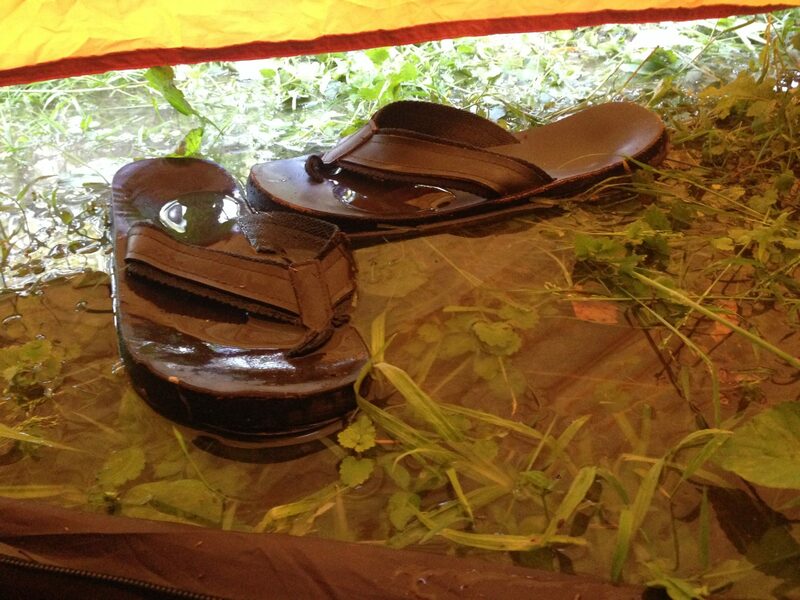 My tent bottom had several inches of water under it. As I slowly sat up I noticed my vestibules were covered in 3-4 inches of water and my panniers, dry bag and sandals were floating. I unzipped the fly and saw the water was all around me. I was on the only spot of “land” I could see in any direction. It would have been easy, maybe even natural, to panic. But I didn’t. I knew I had dry things and I could hang my panniers on my bike and get my tent rolled up and strapped to my bike within 20-minutes… sooner if things degraded. I also could see that the water was flowing, but not fast. It was covering the trails, but only to ankle or knee height. This is not ideal, but it was escapable. I knew there was a road within 5 miles, in one direction, and more than 6 miles in the direction from where I came. I chose the five mile direction and was rewarded with a forgotten road route much closer. The bottom line? I could have panicked, abandoned my gear, or made a poor decision I’d regret later. Instead I took a minute to think logically and clearly, and everything worked out fine. I love the C+O, but to be honest, I probably should have considered an alternate route. When you know there’s flooding possibilities, it might be time to pull out the map and consider another way to get where you want to go!